If you search through the history of advertising, you might find a smaller mascot than the GEICO Gecko, but we doubt you'll find another with this much personality. His Cockney-Aussie accent and dry sense of humor have earned him a huge following, making this tiny green lizard one of today's most recognizable personalities. Fans enjoy watching him ordering takeout from a tiny New York City apartment, visiting a battleship, and even hiking the Rockies with a pair of famous cartoon characters. 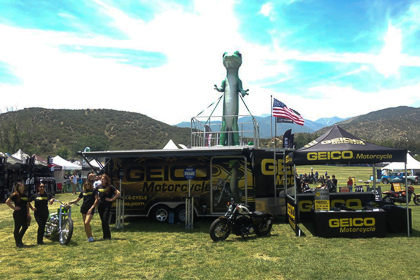 It's no surprise, then, that GEICO's Event Marketing Buyer, Jason Mildenstein, chose the iconic mascot to represent them at upcoming events. In fact, this 8-foot-tall inflatable gecko has everything you'd want in a mascot: eye-catching appeal, instant recognition, and he's pretty photogenic, too. You'll often find visitors dropping by the GEICO booth just to pose for a picture with the famous lizard, giving the company a well-deserved boost in traffic everywhere he goes. Best of all, though, despite his size, he's super portable — a critical consideration when you're tasked with attending more than 1,000 events each year. That makes this larger-than-life gecko both a crowd pleaser and a favorite among the staff.